The problem with lateness is that it’s more contagious than punctuality. When James Connelly worked on a public-utilities commission, one of the five commissioners would be late, invariably triggering others to make phone calls and sharpen pencils while they waited. “What started as four out of five (attending), and then briefly became five, had dwindled to three," he says. “It was like some kind of Marx Brothers skit." He tried to reform it by starting the meeting anyway. But he found that attendees would recap the issues for the tardy person, thereby erasing the penalty. He never succeeded in reforming the chronic laggards. “I hold it against people when they’re habitually late," says venture capitalist Bill Frezza. “My desire to do business with them goes down." Anthony Warren, a professor of entrepreneurship at Penn State’s Smeal College of Business, deducts points from students who show up late. “It’s an outrageous expression of arrogance," he says. More people prefer messiness, loud noises and even bad smells to late people. 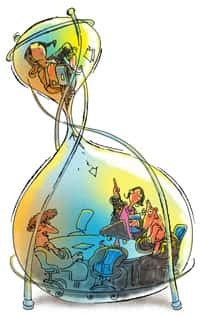 In a recent study commissioned by staffing firm Randstad USA, 54% of respondents said others’ poor time management skills drove them nuts, second only to office gossip (60%). Even late people can’t stand it when others are late, in part because from the point of view of habitually late people, meetings start very promptly. What makes people late? Maybe it’s being overly optimistic about the time needed to commute and park, a warm bed in a cold room, or a task for which no amount of planning can apportion adequate time, such as getting that second sock on a toddler’s foot. Most chronically late people consistently underestimate time by 25-30%, says Diana DeLonzor, author of Never Be Late Again. “Late people engage in magical thinking," she says. “They remember that day 10 years ago when they made it to work in seven minutes flat. That becomes their standard." That explains one of the most baffling types of late people: Those who are routinely late by a precise amount of time—the punctually late. In the past, research suggested lateness had its roots in psychological issues of avoidance and anxiety. But more recent research shows late people are tardy to welcomed events, too. Piers Steel, a professor at the University of Calgary’s Haskayne School of Business, says late people can be impulsive, but sometimes they’re just chronically busy. “There’s not one comprehensive theory why everyone’s late," says Steel, who authored an article earlier this year called The Nature of Procrastination. But one primary cause is that people “can’t get motivated well before their deadlines," he adds. Part of the frustration is that late people seem more likely to change punctual people than the other way around. When Barbara Otto, a retired international banker, worked overseas, “I realized quickly that I would wind up in an emergency room if I didn’t adjust my expectation," she says. To cope with diddling staffers, she gave phoney deadlines. But her tactic became obvious. The worst late people use time as a weapon. Craig Sparks, a corporate lawyer, used to show up at his client’s office for meetings with accountants, investment bankers and other lawyers. The executive kept them waiting. “He became a braggart about how many dollars he was wasting by keeping us all in the conference room waiting," says Sparks. “It was really perverse." Leil Lowndes, author of How to Talk to Anyone, admits that she gets a little rush by being late and will almost make herself tardy, as long as the meeting isn’t a really important one. When she should be hightailing it, she says: “I find myself having to fix a fingernail." But there’s another allure. “Subconsciously, I might feel like I’m feeling more important than these people because they’re all waiting for me," she says, quickly adding, “It’s really rude and really disrespectful."